The adenosine antagonist 7-methylxanthine (7-mx) works against myopia in animal models. In a clinical trial, 68 myopic children (mean age 11.3 years) received either placebo or 7-mx tablets for 12 months. All participants subsequently received 7-mx for another 12 months, after which treatment was stopped. Axial length was measured with Zeiss IOL-Master and cycloplegic refraction with Nikon Retinomax at −6, 0, 12, 24, and 36 months. Axial growth was reduced among children treated with 7-mx for 24 months compared with those only treated for the last 12 months. Myopia progression and axial eye growth slowed down in periods with 7-mx treatment, but when the treatment was stopped, both myopia progression and axial eye growth continued with invariable speed. The results indicate that 7-mx reduces eye elongation and myopia progression in childhood myopia. The treatment is safe and without side effects and may be continued until 18–20 years of age when myopia progression normally stops. Trial registration: ClinicalTrial.gov. Registration number NCT00263471. www.clinicaltrials.gov. Normally, the axial length of the human eye increases from 17 mm at birth to 24 mm at 14 years of age. From an initial hypermetropia the refraction gradually changes toward emmetropia. It has been hypothesized that a growth-control mechanism exists, which can either accelerate or slow down axial growth in response to defocusing of the retinal image during the period of normal eye growth. Results from experimental myopia in mammals suggest that this mechanism works by regulating the scleral extensibility through complex changes in the synthesis and degradation of extracellular matrix components [1, 2, 3]. In myopic children an excessive eye elongation is typically seen from age 6 years until 20 years. The axial length will then be in the range of 24–28 mm. Until the age of 14 years, the increase in myopia is approximately linear , after which a slow deceleration is seen . With maturity, an increase in collagen cross-linking occurs , which probably explains the gradual stabilization of myopia. The myopic eye differs in shape from normal eyes, because the increase in length (0.35 mm per diopter) is greater than the increase in height (0.19 mm per diopter) and width (0.1 mm per diopter), resulting in the characteristic “egg-shape” of highly myopic eyes . With increasing axial length there is an increased risk of potentially blinding complications later in life, such as retinal detachment, macular degeneration, or glaucoma. About 23% of all cases of retinal detachment occur in eyes with myopia of more than −6 dioptres . This underlines the importance of finding an efficient and safe way to prevent excessive axial elongation. There is today no treatment that efficiently and without side effects controls the progression of myopia . Topically applied muscarine antagonists, like the non-selective antagonist atropine, and the M1 selective antagonist pirenzepine have been shown to reduce myopia progression and axial eye growth [10, 11, 12]. The mechanism of action of atropine and pirenzepine has not been established, but it is assumed that it is independent of their action on accommodation, and that it may depend on receptors in the retina or the sclera . Reduced accommodation and dilation of the pupil, however, remain a problem both with atropine and to a lesser degree with pirenzepine. The biomechanical properties of sclera are determined by the contents and organization of proteoglycans and collagen . Collagen accounts for about 80% of the dry weight of sclera . It is known that plastic deformation (creep) of tissues is directly related to the proportion of small diameter fibrils . The diameter of the collagen fibrils in sclera from myopic eyes is reduced compared to normal eyes, as are the contents of collagen and glycosaminoglycans . Experimental myopia in mammals is accompanied by a decrease in the scleral content of proteoglycans and collagen , with reverse changes taking place during recovery . 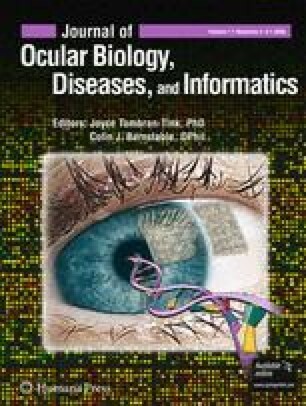 In mammalian models of high myopia, a thinning of the posterior sclera and an increased number of small diameter collagen fibrils in posterior sclera is found [20, 21]. Treatment of young rabbits with a metabolite of caffeine and theobromine, 7-methylxanthine (7-mx), increases the thickness of the posterior sclera, increases the content of collagen-related amino acids in posterior sclera, and at the same time increases the diameter of the collagen fibrils in the posterior sclera . Recently, 7-mx has been shown to reduce the amount of myopia and eye elongation induced by form deprivation in guinea pigs and to counteract the thinning of posterior sclera and of collagen fibrils induced by form deprivation . Theobromine and its metabolite, 7-mx, both have very low toxicity [24, 25] and no carcinogenic effects . The aim of this study was to test whether 7-mx is useful against axial elongation and myopia progression in childhood myopia. One hundred seven children, aged 8–13 years, with a minimum myopia of −0.75 diopters (cycloplegic) in one eye were screened using two subject visits with an average interval of 6 months. Eighty-three were found to have an average axial growth rate of 0.075–0.39 mm per 6 months, and were enrolled in the study. The low cut-off was chosen in order to exclude children with a normal or close to normal axial growth rate. The high cut-off was chosen in order to exclude atypical cases with an extremely fast progression. The normal axial growth rate in children of this age-group is around 0.05 mm per 6 months . All participants were Danish. Children using soft contact lenses were accepted. All children used single vision lenses. The degree of under-correction was not assessed, but the parents were encouraged to have the children’s correction adjusted at regular intervals. The study followed the tenets of the Declaration of Helsinki. Informed consent was obtained from the participants and their parents. Approval was obtained from the Danish Medicines Agency and the Ethics Committee for the municipality of Copenhagen and Frederiksberg. The trial was registered at www.clinicaltrials.gov, Reg.NCT00263471. During a 12-months placebo-controlled trial, participants received one tablet every morning. The tablets had a diameter of 12 mm and a thickness of 3 mm. Active tablets contained 400 mg 7-mx, placebo tablets only standard filling and binding substances. Peak serum concentration after an oral dose of 400 mg 7-mx in adults is around 20 µmol/l with a half-life of 200 min (unpublished results, SM Ribel-Madsen & K Trier, 2004). In the rabbit experiment mentioned above , peak serum level of 7-mx was around 70 µmol/l and half-life around 1 h.
The 7-mx substance was synthesized by Sigma-Aldrich Co. (Fluka works, Buchs, Switzerland). The tablets were manufactured and packed in a pharmacy certified for pharmaceutical production (Glostrup, Denmark). Participants were asked to bring unused tablets at the end of the follow-up period and the remaining tablets were counted. The primary outcome measure was axial growth rate. Secondary outcome measure was myopia progression. The axial length was monitored with non-contact, partial coherence interferometer (Zeiss IOL-Master) . The refraction was measured with an autorefractor (Retinomax, Nikon) 30 min after one drop of 1% cyclopentolate in each eye. In case of astigmatism, half of the astigmatism was added to the sphere. The same Retinomax autorefractor and IOL-Master was used throughout the trial. Measurement stability was confirmed by means of test eyes. Outcome measures were taken four times and the average calculated. Weight was measured at base-line, and weight, height, blood pressure, heart rate at the end of the trial, and participants were questioned specifically for CNS, gastrointestinal or cardiopulmonal symptoms. From a pilot trial, a standard deviation of 0.063 mm on axial growth per year was found. The smallest difference in mean value of axial growth not to be overlooked was set to 0.050 mm. With an accepted risk of type I error of 5% and of type II error of 20%, it was calculated that the number of participants needed in each group was 24. For the 12-month placebo-controlled trial, participants were randomized in a 1:1 ratio to receive 7-mx or placebo. The allocation sequence was generated in the pharmacy and sealed and numbered containers consecutively handed out to the participants. Outcomes were assessed unaware of group assignment at Trier Research Laboratories. No participants or investigators became unmasked during the first 12 months of the trial. The distribution of demographic data did not deviate substantially from the normal and variances were homogeneous, hence parametric tests were used. For all data on the state and development of myopia was calculated the average of data from each subject’s right and left eye, and these average data were subjected to significance tests. The significance of differences between mean values referring to the respective treatment groups was tested with Mann–Whitney test, because of inequality of variances of some of the variables. The significance of differences in axial length or myopia progression rates between periods within the same individual was tested with paired Student’s t test. Correlations were analyzed with Pearson’s test and proportions with Fisher’s exact test. After completing the 12-month placebo-controlled trial, children from both the placebo and the 7-mx group were given the option of continued treatment with 7-mx 400 mg either once or twice per day for another 12 months. After completing 24-month follow-up, all participants discontinued treatment with 7-mx, and axial growth and myopia progression was followed for another year by measurement at the end of the total of 36 months’ follow-up. The 12-month placebo-controlled trial was completed by 77 children. The reason for not completing was in no case stated as side effects. Compliance among those completing the 12-month placebo-controlled trial was 89% in the 7-mx group versus 92% in the placebo group. No differences were found as to weight, height, blood pressure, and heart rate. No subjective side effects were reported. Axial growth rate during the 12-month placebo treatment period was found to be proportional to base-line level (p < 0.01, Fig. 1). To ensure comparability between the 7-mx and the placebo group, data were therefore compared within two stratification layers, one with a base-line axial growth rate of 0.075–0.190 mm per 6 months, including 19 treated with 7-mx and 27 treated with placebo, and the other with a base-line axial growth rate of 0.200–0.390 mm per 6 months, including 16 treated with 7-mx and 15 treated with placebo. Tables 1 and 2 show axial growth, myopia progression, and change in corneal curvature in the two stratification layers. In both, axial growth was reduced in the 7-mx group compared with the placebo group. The difference was −0.055 mm per year (95% Cl −0.114 and +0.005 mm per year) for children with a moderate base-line axial growth rate (p = 0.073), and −0.031 mm per year (95% Cl −0.150 and +0.087 mm per year) for children with a high base-line growth rate (p = 0.593). Also the myopia progression was lower in the 7-mx group of both stratification layers, with a difference of −0.108 diopters per year (95% Cl −0.288 and +0.070 diopters per year) (p = 0.227) and −0.091 diopters per year (95% Cl −0.424 and +0.243 diopters per year)(p = 0.582), respectively. The 24-month follow-up period was completed by 68 children. The average daily dose of 7-mx taken by each child during the last 12 months of the follow-up ranged from 40–706 mg per day, average 444 mg per day. No subjective side effects were reported. Axial growth in children with a moderate base-line axial growth rate (n = 40) treated for 24 months with 7-mx was 0.329 mm (SD 0.143 mm) compared with 0.427 mm (SD 0.193 mm) in the group treated with placebo for the first 12 months and with 7-mx for the last 12 months (p = 0.048) (Fig. 2). The corresponding axial growth for children with a high base-line axial growth (n = 28) was 0.547 mm (SD 0.212 mm) for the 7-mx group, and 0.584 mm (SD 0.193 mm) for the placebo/7-mx group (p = 0.667) (Fig. 3). Myopia progression in children with a moderate base-line axial growth rate (n = 40) treated for 24 months with 7-mx was 0.627 diopters (SD 0.329 diopters) compared with 0.844 diopters (SD 0.450 diopters) in the group treated with placebo for the first 12 months and with 7-mx for the last 12 months (p = 0.141) (Fig. 4). The corresponding myopia progression for children with a high base-line axial growth (n = 28) was 1.131 diopters (SD 0.443 diopters) for the 7-mx group, and 1.010 diopters (SD 0.549 diopters) for the placebo/7-mx group (p = 0.667) (Fig. 5). Percentage myopia stabilization in the period 12–24 months (defined as less than 0.25 diopters myopia progression during the 12 months) is shown in Table 3. Among children treated for the whole 24-month period with 7-mx, 59% of children with a moderate axial growth rate at base-line, and 20% of children with a high axial growth rate at base-line were stable. Sixty-one children completed 36-month follow-up. In both the group treated with 7-mx 0–24 months (n = 28) and the group treated with placebo 0–12 months and 7-mx 12–24 months (n = 33), axial growth rate in the first as well as the second year of treatment was significantly lower compared with the precedent period (p < 0.00001/p = 0.001, first year and p = 0.006/p = 0.001, second year) (Fig. 6a–b). The myopia progression rate, on the other hand, only slowed down in periods with 7-mx treatment (p < 0.0005/p = 0.098, first year and p = 0.013/p = 0.01, second year) (Fig. 6c–d). However, in both groups, axial growth rate (p = 0.533/p = 0.179) and myopia progression rate (p = 0.162/p = 0.138) after discontinuation of the treatment (third year) did not differ significantly from the precedent period (Fig. 6a–d). In this study, base-line axial growth rate was taken into consideration when comparing inter-group differences in axial growth. The rate of myopia progression is believed to be the most important variate as regards base-line comparability . The finding of a significant correlation between axial growth at base-line and axial growth in the first 12 months of the intervention period supports the importance of using the axial growth rate as one of the inclusion criteria in myopia studies. Frequency of contact lens wear was close to equal in the 7-mx group and the placebo group (17% versus 19% during the 12-months trial). Contact lens wear does not seem to affect the growth of the vitreous chamber significantly . The degree of under-correction in the participants was not recorded in this trial, and could therefore theoretically be a confounding factor. One study found that under-correction enhances myopia progression , while another found no effect . It is not known whether the axial growth rate is affected by under-correction. At 12 months, the lowest axial growth in both stratification layers was found in the 7-mx groups, but the differences were not significant. At 24 months, however, a significantly lower axial growth was found in children with a moderate base-line axial growth rate treated for all 24 months with 7-mx compared with those treated with placebo for the first 12 months and 7-mx for the last 12 months (difference 0.098 mm), whereas the difference among children with a high base-line axial growth rate (0.037 mm) was non-significant. Children with a high base-line axial growth rate (0.200–0.390 mm per 6 months) have a myopia progression of up to 2 diopters per year. Such severely progressing myopia is frequently linked to specific genetic abnormalities, and may therefore represent a sub-group, possibly more refractory to treatment than the majority of myopes. Nevertheless, in the second year of the intervention period, average axial growth among children with a high base-line axial growth rate treated for all 24 months with 7-mx, was reduced to 0.22 mm per year from an initial 0.52 mm per year at base-line. This is lower than the expected average axial growth rate of 0.25 mm per year for age-matched Danish myopes, including low-, moderate-, and high-progressors . The corresponding myopia progression rate in the second year of the intervention period among children with a high base-line axial growth rate treated for all 24 months with 7-mx was reduced to 0.49 diopters per year from 1.20 diopters per year at base-line. The expected average myopia progression rate for age-matched Danish myopes, including low-, moderate-, and high-progressors is 0.48 diopters per year . For children with a moderate axial growth rate at base-line (0.075–0.190 mm per 6 months), treated for all 24 months with 7-mx, axial growth rate was reduced to 0.14 mm per year in the second year of treatment from 0.27 mm per year at base-line, and the myopia progression rate to 0.23 diopters per year in the second year of treatment from 0.52 diopters per year at base-line. Thus, in comparison to the average of age-matched Danish myopes, including low-, moderate-, and high-progressors , both axial growth and myopia progression was reduced by around 50% in the second year of treatment with 7-mx. In an unselected material of myopes, the percent with stable myopia increased with age from 14% for 12-year-olds to 63% for 18-year-olds . In comparison, our finding of a markedly higher percentage of stable myopia (59% and 21%, moderate and high base-line axial growth rate respectively) in the second year of treatment, further supports that treatment with 7-mx stabilizes myopia. In the age interval 11–14 years, myopia progression and axial elongation is close to linear . A decrease in both myopia progression rate and axial elongation rate during both the first and the second year of treatment with 7-mx is therefore unexpected. The absence of a further reduction of myopia progression and axial elongation in the third year coincides with the discontinuation of treatment and is consistent with the treatment being efficient. Methylxanthines in non-toxic doses block adenosine receptors (ADOR) competitively. Adenosine in the concentrations found under physiological conditions activates primarily A1 and A2A adenosine receptors (ADORA1 and ADORA2A) on the cell surface. ADORA1s are widely distributed in the CNS, whereas ADORA2As are found mainly in the dopamine-rich regions of the brain . Adenosine has a general homeostatic role in the regulation of cell metabolism, but also a specific neuromodulatory role with ADORA1s having an inhibitory role and ADORA2As having a facilitatory role in the release of neurotransmitters such as dopamine, noradrenalin, acetylcholine, glutamate, and serotonin . ADORA1s and ADORA2As have been localized in the ciliary body and the retina and ADORA2As in the retinal pigment epithelium of adult rats  and humans (unpublished results, Zhongshan Ophthalmic Center). Both ADORA1s and ADORA2As are expressed in human scleral fibroblasts . Experimental myopia in animals has been linked to changes in retinal dopamine and acetylcholine neurotransmission [39, 40, 41, 42, 43, 44]. Both of these neurotransmitters are modulated by ADORs [45, 46, 47, 48, 49, 50]. The mechanism by which 7-mx affects eye elongation and myopia progression could therefore theoretically involve modulation of muscarinic acetycholine or dopamine receptors. On the other hand, it is also possible that ADORs are directly involved in the control of eye growth. Because of receptor adaptation, the effects related to blocking of ADOR1s are attenuated during chronic treatment with non-selective ADOR antagonists like 7-mx, whereas effects related to blocking of ADORA2As are unchanged [51, 52, 53]. Adenosine liberated from the retina is believed to activate ADORA2s on the retinal pigment epithelium and augment the standing potential (SP) . The effect on the SP might therefore give us a measure of the potency of a specific methylxanthine as a blocker of adenosine receptors. The receptor affinity of 7-mx is three to five times higher than theobromine . Correspondingly, the light-rise of SP in humans is more reduced by 7-mx than by theobromine (unpublished results, K Trier, 2004). Interestingly, high ametropia in children is associated with retinal electrophysiological abnormalities, a finding consistent with the hypothesis that the retina is involved in the process of emmetropization . In conclusion, systemic treatment with 7-mx appears to be efficient in retarding axial elongation and myopia progression among myopic children. The treatment is safe and without side effects, and may be continued until 18–20 years of age, when age-related cross-linking of collagen prevents further elongation of the eye. This work was supported by grants from “Jørgen Bagenkop Nielsens Myopi-Fond” and “Generalkonsul Einar Høyvalds Fond”, and by “Øjenlæge Klaus Trier ApS”. Approval of the trial has been obtained from the Danish Medicines Agency and the Ethics Committee for the municipality of Copenhagen and Frederiksberg (KF 02–042/03).